Banks are contacting customers who are past due or in financial trouble and offering owners or tenants up to $20,000 in relocation assistance to move out of home and hire an experienced agent to sell the home as a short sale. Banks are also offering owners money to agree to a deed in lieu foreclosure in some instances as well. There are several advantages for taking the bank up on their offer. If you let the property go to foreclosure, you’ll be evicted without relocation assistance. Additionally your credit will suffer more in a foreclosure than a short sale or deed in lieu. The owner is more in control when actively pursuing a sale through an experienced agent than giving up all control to the bank and the legal system. 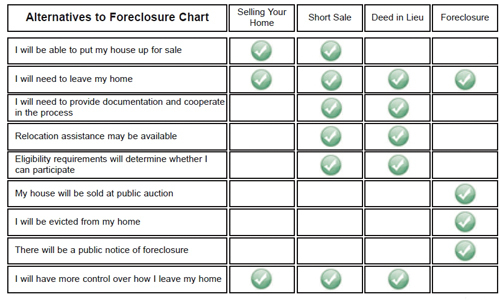 A short sale is a commonly used alternative to foreclosure. Generally, when putting your home on the market, the goal is to market and sell your house for an amount greater than any and all outstanding liens against the property. Liens include all mortgages, escrows and fees on the property. If you can no longer afford to make your mortgage payments and your house is worth less than you owe, a short sale allows you to sell your house at the current fair market value. You then have an option to move to a more affordable situation. In a short sale, the investor or owner of your loan must approve the sale because they are entitled to repayment of the loan and will be receiving less than the amount owed. If you have additional liens on your property with other lenders, such as a home equity loan, all investors must come to an agreement in order to complete the short sale. This process takes time, and an experienced agent is required to navigate and negotiate through these challenges. Another alternative is a deed in lieu of foreclosure. With a deed in lieu, you voluntarily transfer ownership of the property to your investor to satisfy the amount due on your first mortgage. In some cases, you may be eligible for a deed in lieu without first attempting a short sale of your home. A deed in lieu generally takes about 90 days, depending on your situation. In either a short sale or deed in lieu you may be responsible for paying a deficiency. There are many factors that determine this, such as if the home was your primary residence, what state you live in, your financial situation, etc. Sometimes this can be negotiated with your lender. In any event, most lenders agree it is much better on your credit report and they are likely to lend you money in the future faster if you agree to a short sale or deed in lieu instead of a full blown foreclosure. If you’ve been contacted by your lender, it may be at least worth considering your options. Don’t throw away documents sent to you by your lender. If they make you an offer call your attorney for legal advice or an experienced real estate agent for advice on the program and assistance selling your home. The banks really don’t want your home back. They’d prefer that owners pay their mortgage payments. When that’s not possible, it may be less expensive to offer the occupant relocation assistance and get on with the process of selling the home before it gets to the costly foreclosure process. Once the home gets into foreclosure, the costs mount, the credit suffers, and owners lose options. If we can help, call us at 239-489-4042. Each situation is unique and it takes time to look into each program. The good news is we have past experience with many of these programs. Posted in Cape Coral, Fort Myers, Lehigh Acres, Southwest Florida Real Estate, SW Florida Bank Foreclosures.Tagged Ellis Team RE/MAX Realty Group, Fort Myers Florida, Fort Myers short sales.